iPod case for the kids? She's not even in elementary school yet. 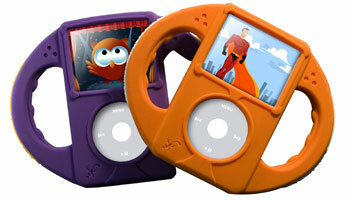 The Tadpole is a protective, kid-friendly case that turns an iPod into a "portable entertainment device for your child." The brand new dad in me two years ago probably would have found a way to knock this, but the father of a Dora addicted loving two year old in me now thinks this is pretty cool. The problem with it of course is you have to buy an iPod for your kid, or offer up yours. But having a case that turns it into a kid-friendly movie player would come in pretty freaking handy on a plane or long car ride.